Notes: The sleeve contains a tracklisting discrepancy between it and the actual tracklist printed on the disc itself. It mis-labels the Original Mix and the Perfecto Mix as the Long Version and the Original Version. The correct tracklist found on the disc is displayed below. Notes: The sleeve contains a tracklisting discrepancy between it and the actual tracklist printed on the disc itself. It mis-labels both the 12" Version, the Original Mix and the Instrumental as the Long Version, the 7" Version and the Original Version respectively. The correct tracklist found on the disc is displayed below. 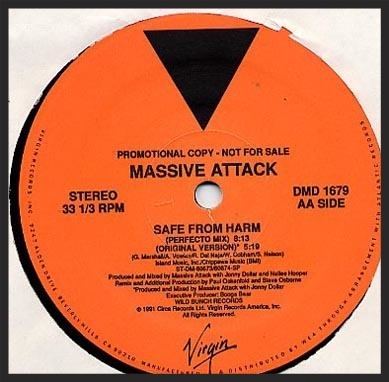 Notes: This is a remix single for Safe From Harm, basically the second part of a 2 part 12" vinyl release. The sleeve contains a tracklisting discrepancy between it and the actual tracklist printed on the disc itself. It mis-labels both the Perfecto Mix, the Just A Dub Mix and the Instrumental as just simply Remix, the Original Version and the Another Version respectively. The correct tracklist found on the disc is displayed below. Notes: This was the first cassette single that was released in the USA. 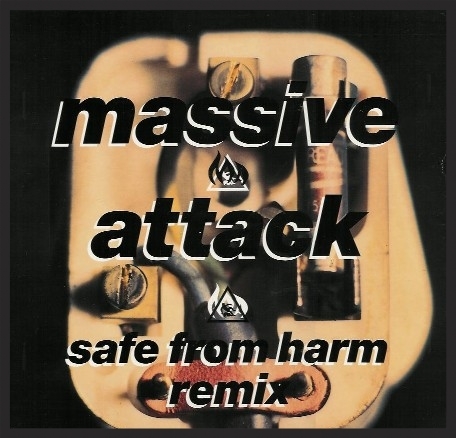 Notes: This promo was used to promote Massive Attack and Safe From Harm in North America for a possible single release of Safe From in the territory which would ultimately never happen. The 7" Instrumental is the same as the Instrumental version found on the other releases. This is also the only release on CD which contains this 7" Instrumental/Instrumental. Notes: This videotape promo was issued by West 1 Television as a VHS tape using the PAL format. Notes: There is a catalogue number discrepancy between the sticker on the front cover and with the actual sleeve and idsc themselves. The correct catalogue number is displayed above. Notes: Incredibly rare acetate promo. The source from which it came claims that only 5 of these were ever made. Notes: A similar to this one, US promo vinyl copy of Unfinished Sympathy was also produced.